In this article, I introduce one of the terms in Export Import Trade – DTA Domestic Tariff Area. 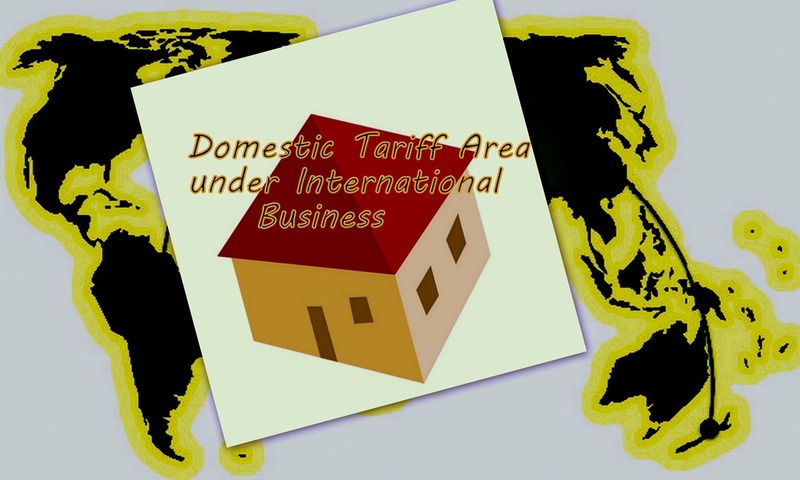 What does Domestic Tariff Area mean? Have you read my article – Customs Bonded Area? I have written in detail in simple language to make you easily understand about Customs Bonded Area. If you go through the said article about Customs Bonded Area, it is very easy to understand about DTA – Domestic Tariff Area. In very simple terms, DTA means the area which is not under customs bonded. The term DTA is normally used by the trade in exported goods, imported goods or locally procuring/manufacturing goods where in any kind of duty is involved. As I have explained in other articles, each EOU or STP unit has a Customs Bonded Ware house which is treated as Customs Bonded Area. If you want to move goods in or out of the said ware house, permission from customs/excise is required. Such goods procured locally or imported attracts duty amount. These units would have imported/procured such goods on the basis of export obligations with government. If a unit under EOU STP fulfilled such export obligation and achieved value addition, the authorities may permit the unit to sell dutiable goods to local market. So once after completion of export obligation, EOU units or STP units sell dutiable goods to Domestic Tariff Area by obtaining permission from the customs/excise authorities. If you obtain any goods under free of duty with government schemes, you can sell the final products to domestic tariff area, once after fulfilling your export obligation with the government licensing authority. I hope, I have clarified DTA Domestic Tariff Area in simple language to make you easily understand. Have you satisfied with this article about Domestic Tariff Area – DTA? Would you like to add more information about DTA – Domestic Tariff Area? Share your experience in handling exports and imports under DTA – Domestic Tariff Area. Comment below your thoughts and experience about this subject – Domestic Tariff Area DTA. Animesh singh: On 19 August 2014 Its really simple and short. Thank you for the post was really helpful. J.N.Dutta : On 14 February 2015 I am in the business of Merchant Export Trading of industrial goods manufactured in India for exporting them to Kuwait. Very recently, while web surfing for acquiring some knowledge about avoidance of taxes for exporting materials from India, I came across your web portal, ‘www.howtoexportimport.com’ and immediately I have developed a deep regard for you for the yeoman’s service you are rendering to the Importing/Exporting community in India by disseminating vital knowledge and experience to people engaged in these trades, particularly to the new entrants in business like me. I would remain ever grateful to you if you kindly provide me guidance in the following matter which I require very urgently. In response to my Enquiry to a manufacturer of industrial valves located in an Export Promotion Industrial Park (EPIP), in Bengaluru on the back of an export Enquiry which I received just a few days ago from Kuwait, the manufacturer has quoted the following taxation terms in addition to the basic price of the valve: Quote ? Cumulative duties will be charged extra at the time of dispatch as per the statutory norms. At present, the duty is 14.99% (being a DTA sale). The modvat amount is 10.38%. ? Central Sales Tax will be charged extra at the time of shipment. The present rate is 14.5% without any form or 2% against form ‘C’. Form C must be sent within 2 weeks of receiving our invoice. Any statutory levies / taxes or Duties (like Octroi) etc. shall be charged extra as applicable at the time of shipment and invoicing. Unquote My specific query is – how can I avoid paying any taxes / duties as I shall export the valve to Kuwait completely in order to make my bid competitive? R V Patel Impex : On 02 July 2015 Hello Sir. My Name is Romit Patel from Bharuch, Gujarat.I want to start importing of mobile accessories from China, I would like to know procedures and custom tariff and trade terms. Shree Export : On 13 October 2015 Sir, this refers to below e-mail, please note that there is no domestic sales, 100% export by drawback scheme. (but not in EOU Scheme). Brajesh Kumar Verma: On 03 June 2016 Yes. This is a very useful information and the unique thing is that on the web anyone can get all the knowledge regarding export and import. In addition if any doubt arises that is also being answered through mail. Really a nice experience. Keep it up. Regards. Peppino Fiori: On 17 August 2016 I have a couple of questions regarding a Custom Invoice for goods shipped from India to UK via Vienna, Austria. I have attached copy of the invoice for you to have a look at it and see if we can make sense. Questions: Can the goods be shipped directly from India to the UK even though in the invoice there is a location (Port of Discharge) different from the final destination (UK) and, consequently entering the UK, without going through Custom controls (due to the facts that on papers it has already entered the EEC and consequently cleared EEC customs). Why, if not done as explained above in *1; clearing Customs at Vienna, pay extra charges due to longer detour. It beats me, I can’t understand the logic or reasoning behind it all. Why not going directly to the Final Destination? Is this a done thing sometime to circumnavigate the custom controls by not paying Duties and Taxes? Could there be a logical explanation as to why of this?? I will really appreciate your experienced view on this as a matter of curiosity and knowledge on how things work in the world of freights. Saeedur Rahman : On 20 November 2016 In a Bid for international procurement of Goods, the Bidders have quoted price on the basis of CIP (port of Entry into Bangladesh). Not mentioned which port of Bangladesh? Airport or Land port? Bidders have also quoted some additional prices for carriage from Bangladesh Port to Place of destinations; where the goods will be delivered.Is there any problem with that?